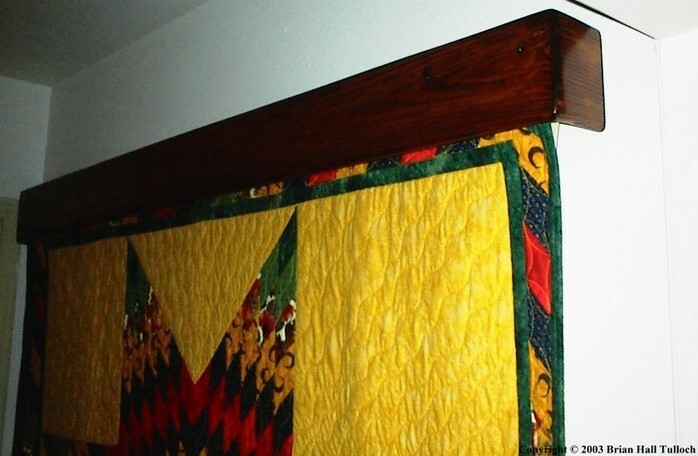 Texas Venom Custom Woodworks - Quilt Hangers All Quilt Hangers are built out of wood, they have a shelf at the top with a plate groove and have a wooden rod to hang the quilt from. Can be built for just about any size quilt. There are several different crowns available or you can have hanger made plain with no crown design. There are also several species of wood and/or stain colors to choose from. All Quilt Hangers are built out of wood, they have a shelf at the top with a plate groove and have a wooden rod to hang the quilt from. Can be built for just about any size quilt. There are several different crowns available or you can have hanger made plain with no crown design. There are also several species of wood and/or stain colors to choose from. Copyright 2011 Brian H. Tulloch/Texas Venom Custom Woodworks. All rights reserved.